that I had written a book for women. Only women. That a man who bought a copy for him- self might as well also buy a pair of heels. . . "The book that I wrote has been described in reviews as tense, taut, and brutal…when you write a book so commonly described with adjectives that are viewed in this (dysfunctional, sexist) society as 'male,' and men still aren't inter- ested in reading it because the author is female, it's…depressing. And enraging." Black takes on such issues with intelligence and candor. With similar candor, Black speaks about mis- takes she made as a writer when she avoided the difficult junctions in her work. "I have gone back into stories and realized that I stopped [a character] from taking a trip only because I semi-consciously realized that I would have had to do research on the desti- nation. Authorial laziness is not a par ticularly fer tile creative vein… "In real life, we don't get to return to our twenties and step onto the airplane we were afraid to fly; or audition for the play that excited and scared us; or ask the beauty to dinner ; or take the job in Boston. . . What's done is done. "But in fiction, what has been done can be undone and what hasn't been done can be done…. No limitations. No excuses. And no regrets." There are many books written about writing—some famously helpful to those just star ting out— but this is the smar test, most com- plex, original, and honest ap- proach I've seen. Should be required reading in ever y MFA program. 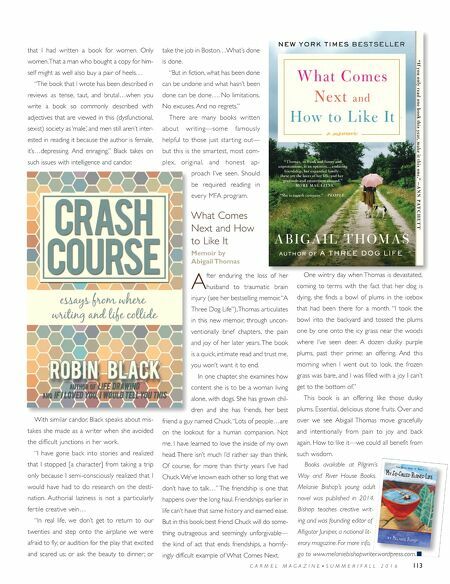 What Comes Next and How to Like It Memoir by Abigail Thomas A fter enduring the loss of her husband to traumatic brain injury (see her bestselling memoir, "A Three Dog Life"), Thomas articulates in this new memoir, through uncon- ventionally brief chapters, the pain and joy of her later years. The book is a quick, intimate read and trust me, you won't want it to end. In one chapter, she examines how content she is to be a woman living alone, with dogs. She has grown chil- dren and she has friends, her best friend a guy named Chuck. "Lots of people…are on the lookout for a human companion. Not me. I have learned to love the inside of my own head. There isn't much I'd rather say than think. Of course, for more than thirty years I've had Chuck. We've known each other so long that we don't have to talk…" The friendship is one that happens over the long haul. Friendships earlier in life can't have that same history and earned ease. But in this book, best friend Chuck will do some- thing outrageous and seemingly unforgivable— the kind of act that ends friendships, a horrify- ingly difficult example of What Comes Next. One wintry day when Thomas is devastated, coming to terms with the fact that her dog is dying, she finds a bowl of plums in the icebox that had been there for a month. "I took the bowl into the backyard and tossed the plums one by one onto the icy grass near the woods where I've seen deer. A dozen dusky purple plums, past their prime: an offering. And this morning when I went out to look, the frozen grass was bare, and I was filled with a joy I can't get to the bottom of." This book is an offering like those dusky plums. Essential, delicious stone fruits. 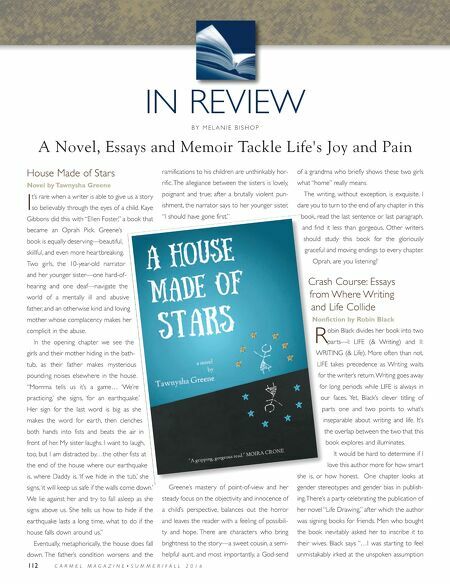 Over and over we see Abigail Thomas move gracefully and intentionally from pain to joy and back again. How to like it—we could all benefit from such wisdom. C A R M E L M A G A Z I N E • S U M M E R / F A L L 2 0 1 6 113 Books available at Pilgrim's Way and River House Books. Melanie Bishop's young adult novel was published in 2014. Bishop teaches creative writ- ing and was founding editor of Alligator Juniper, a national lit- erary magazine. For more info, go to www.melaniebishopwriter.wordpress.com.